The Maintenance Supervisor Position exists to provide leadership and direction to the Maintenance team. This position is responsible for the day-to-day maintenance and reliability of the plant manufacturing systems. This position will work with both the Maintenance Planner / Scheduler and Maintenance Manager to plan and ensure the execution of all Corrective, Preventive and Predictive maintenance work involving plant process equipment in accordance with all GMP standards. Hours: Starting at 7 PM - 5 AM. Must be able to work extended hours. Weekend and holidays hours may be required based on production needs. If you have questions, please call the HR Solution Center at 844-LOL-HR4U (844-565-4748) M-F 8:00am-4:30pm CT.
Land O'Lakes, Inc. is an Equal Opportunity Employer (EOE) M/F/Vets/Disabled. The company maintains a drug-free workforce, including pre- and post-employment substance abuse testing pursuant to a Drug and Alcohol Policy. 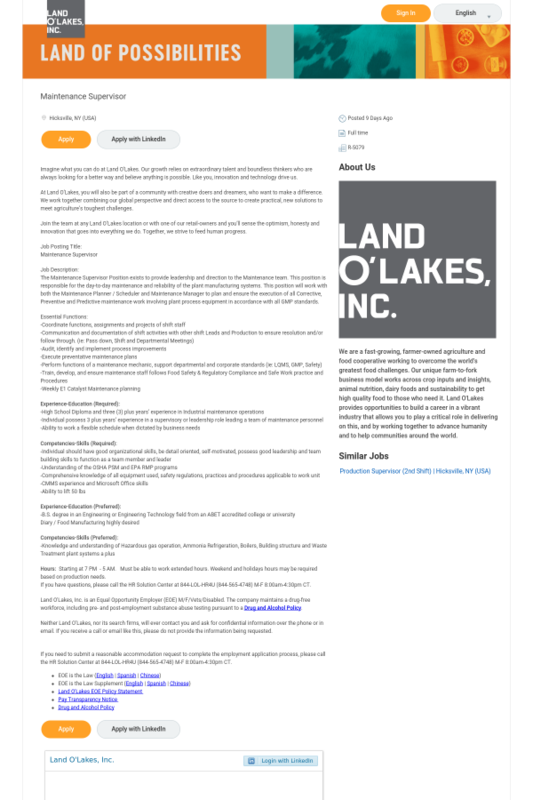 Neither Land O’Lakes, nor its search firms, will ever contact you and ask for confidential information over the phone or in email. If you receive a call or email like this, please do not provide the information being requested. If you need to submit a reasonable accommodation request to complete the employment application process, please call the HR Solution Center at 844-LOL-HR4U (844-565-4748) M-F 8:00am-4:30pm CT.